What an amazing book is Asta’s Book by Barbara Vine*. It was published as Anna’s Book in the USA. I loved A Dark Adapted Eye, A Fatal Inversion and The House of Stairs, but Asta’s Book tops all those. I think it’s brilliant! It’s a book that demanded all my attention and I just didn’t want to put it down. There’s a murder, a missing child, a question of identity and overarching it all are the stories of two families – the Westerbys and the Ropers and all the people connected to them. So many characters, so many red herrings, so many incidents that at first did not appear to be of any or of much importance that turned out to have great relevance. It had me going backwards and forward and placing so many markers in the book to try and keep track of it all. How did Barbara Vine handle so much material in such a clever way? It is so intricately plotted and the portrayal of so many characters is so skilfully handled. It begins in 1905 when Asta Westerby and her husband Rasmus have come to East London from Denmark with their two little boys and their servant Hansine. With Rasmus constantly away on business, Asta keeps loneliness and isolation at bay by writing a diary in her native tongue of Danish. The story is not told chronologically, but switches backwards and forwards between Asta’s diaries, beginning in 1905 when she was pregnant and hoping the new baby would be a daughter, and the present day after Asta’s death. The diaries had been translated and published by her daughter Swanny (Swanhilde), and along with details of the family’s life reveal clues to an unsolved murder and to the mystery of a missing child. After Swanny died Asta’s granddaughter Ann became involved in searching for the truth about these facts. Additional material is also related through a trial transcript and various accounts of events by different people. The book kept me guessing all the way throughout the various mysteries it threw up. I was very tempted to peek at the end of the book for the answers, but managed not to and I’m glad I didn’t as it would have ruined the suspense. I was so impressed at how it all hung together, with no extraneous material – all those minor incidents and characters are completely necessary. As in other books by Barbara Vine it is not only the characters and the mystery that are enthralling, it is also the atmosphere and the settings. Houses in her books take on characters of their own and in this one there are several, maybe the most dominant is Devon Villa where Lizzie Roper was murdered, her mother also died of a heart attack and Lizzie’s daughter, Edith was last seen as she climbed the stairs up to her mother’s bedroom. And then there is the doll’s house that Rasmus made for his daughter, Marie, replicating Padanaram, the Westerbys’ second house in Shepherd’s Hill, Highgate. 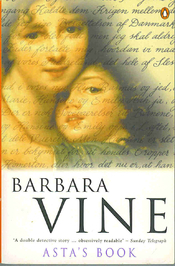 *Barbara Vine is the pseudonym of Ruth Rendell, who was a Fellow of the Royal Society of Literature and the author of many thrillers and psychological murder mysteries . She died in 2015 at the age of 85. Her mother was born in Sweden and brought up in Denmark; her father, Arthur Grasemann, was English. As a result of spending Christmas and other holidays in Scandinavia, Rendell learned Swedish and Danish. Asta’s Book is my third book for the 20 books of Summer Challenge and the 25th for the Mount TBR Reading Challenge. Definitely a book I’d love to re-read. sounds wonderful, so glad you enjoyed. As I said on Goodreads I actually had a secondhand copy of this that I picked up in a charity shop and then sent back. Silly me. I’ll definitely get hold of it again at some stage as your review makes it sound compelling. Your review makes this book sound great. I’ve not read any Barbara Vine or Ruth Rendell books yet. So glad you enjoyed this, Margaret. In my opinion, Rendell/Vine was an expert at building tension and exploring psychology and the way it works. I think that’s reflected very well in this one. This one has been on my radar for awhile. I need to move it up! Excellent review! I also really enjoyed “Asta’s Book” but my favourite Barbara Vine is “No Night Is Too Long”. Have you read it? No, Phil – I haven’t read No Night Is Too Long – looking forward to that and to the other books by Vine I’ve still to read. Your review makes me want to read it ! You have me hooked! Sounds great. I’ve added it to my ridiculously long list!